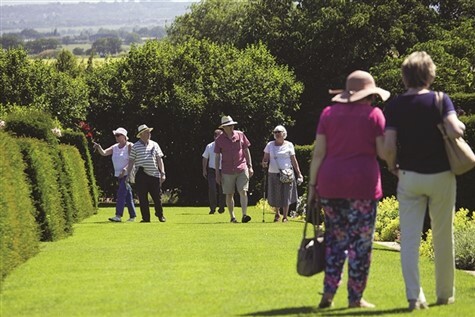 The RHS flagship garden in the heart of Essex, famed for its impressive Mixed Borders, rock and woodland gardens and a magnificent Glasshouse. NEW for 2019 we are pleased to be working in partnership with the Royal Horticultural Society  The worlds leading gardening charity. When you book on one of the 4 tours listed on Pages 34-35 you will automatically receive ONE YEARS GIFT MEMBERSHIP to the RHS. Your gift will arrive in a deluxe pack, including six luxury postcards, two packets of seeds (EU only), vouchers for a free RHS tote bag and £5 to spend at RHS Gardens. Your gift will require activation. You and your loved one can enjoy great days out at more than 200 gardens (including the four RHS Gardens). Access to quieter Members Days at world-renowned RHS Flower Shows. Immerse yourself in The Garden magazine each month  every issue is packed with advice and the RHS Life section is designed to help you make the most of your membership. Develop your gardening skills with free advice from their team of horticultural experts, either face-to-face or via post, phone or email. We travel to our hotel, arriving in the afternoon for tea/coffee & biscuits. Today, we visit RHS Garden Hyde Hall - surely one of the finest gardens in the East of England. This 145-hectare (360-acre) estate is constantly evolving, as the gardening team strive to retain the original intimacy and charm of this horticultural gem, while at the same time aiming to restore much of the estate to its former rural glory, including its historic hedgerows and woodland. We visit the delightful town of Maldon, located on the Blackwater, before continuing to Papermill Lock for a leisurely afternoon cruise along the Chelmer and Blackwater Navigation. (Refreshments are available on board). After a leisurely breakfast we commence our journey homeward. This tour will include walks over uneven ground which may prove challenging for those customers with reduced and limited mobility. Set in 320 acres of English Countryside including its own golf course and ornamental lakes, this luxurious hotel offers a great base from which to explore Suffolk and Essex.